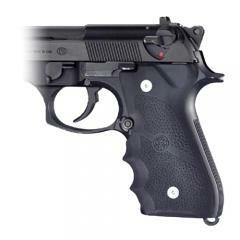 This rubber grip from Hogue fits Beretta 92 and 96 Series semi-automatic pistols, providing shooters with enhanced accuracy, security and comfort. The open-back design screws securely into place, replacing the existing side panels. The soft synthetic rubber material is highly durable and resists corrosion and deterioration caused by firearm solvents. Its slight give allows it to soften the impact of recoil and provide a comfortable grip without feeling spongy, and its textured surface provides a non-slip hold even with wet or gloved hands. Finger grooves in the front of the grip provide a more stable grip that enhances accuracy.